Homa is currently living and working in the United Arab Emirates. She was born in Tehran and left Iran for the UK as a teenager in order to study English. She has since lived in various countries around the world. Her influences have come from ancient Middle Eastern pottery and ceramics and training with international potters in Japan and the UK. Passionate about working with clay, she specialises in mainly thrown Stoneware pieces. 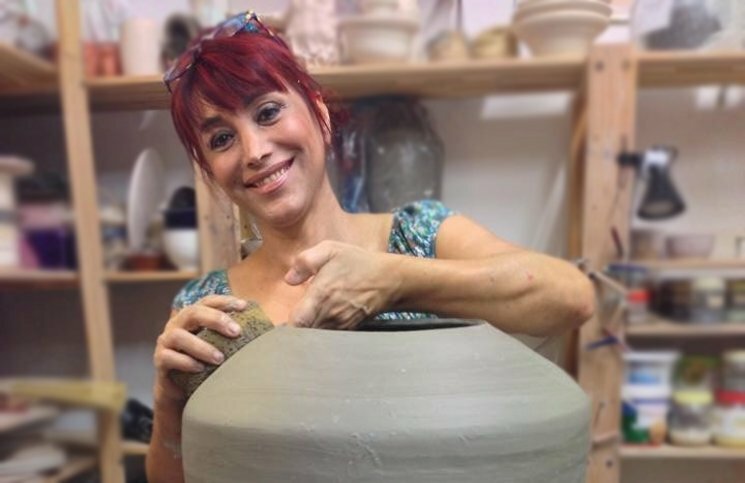 Homa started pottery over 20 years ago and founded the Abu Dhabi Pottery in 1994. She has been taught under the instruction of Oliver De Silva, Judy Firmin, Richard Phethean, Jack Doherty, Margaret and David Frith and Tetsui Okuda in Japan. Homa graduated with a BA Ceramic Design degree at Glasgow School of Art in the UK, where the tutors included: Archie McCall, Bill Brown, Jane Hamlyn, John McGuire, Tony Franks, Greg Daly and Ken Eastman. Homa has taken part in various exhibitions throughout the Emirates and internationally. Following her solo exhibition in 2000, at the Aubgineh & Sofalineh Museum (The National Pottery & Glass Museum) in Tehran, two of her pots were placed on permanent display (she is the only contemporary potter to have the honour of having a permanent exhibit there). Her work has also been exhibited at the Saadabad Palace Gallery and Nivaran Palace Gallery in Tehran. Homa was a prize winner in the 1990 Student’s exhibition at the Abu Dhabi Cultural Foundation, and was winner of the Judges Award (1st prize) at the 2003 Dubai International Art Centre Member’s Exhibition. Homa won the Professional Achievement Award 1st prize at Dubai International Art Centre Members Exhibition in 2008. In 2006, Homa was appointed as a member of the Arts Advisory Committee for the Dubai Community Theater and Art Centre (DUCTAC). Homa is also a keen Martial Artist and Instructor in the Korean Martial Art of Sil Jeon Moo. She was awarded a 4th Dan Honorary black belt in March 2013. Homa also holds a 3rd Dan black belt in Hoi Jeon Moo Sool.